Some cars are rare because there just weren’t ever many built and then there are cars that are rare today because few have survived. 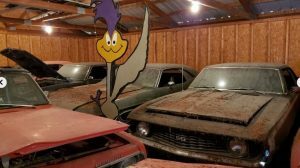 In the case of the later there tend to be a couple reasons there aren’t many left, either they have all rusted to nothing, they were all driven hard, or they were popular for drag racing or hot rodding and have all been modified past the point of ever being returned to original. 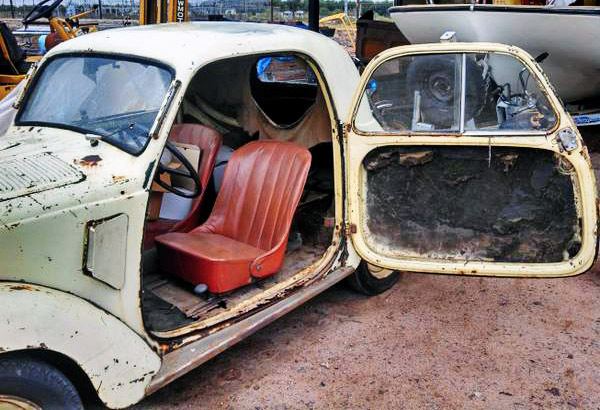 In the case of the Fiat Topolino they have become rare as a result of all three. 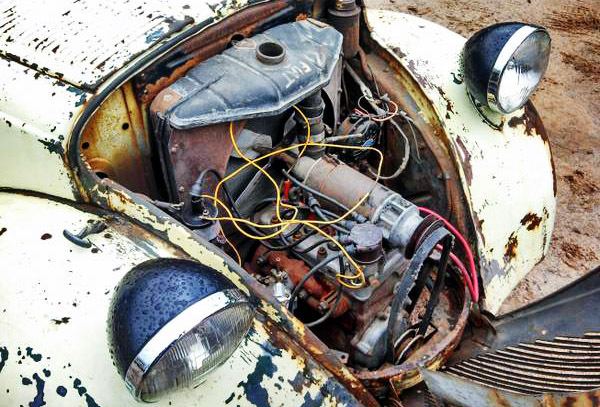 Italian cars have always been known for their rust issues and these were quite popular in the modification crrowd for many years. While Fiat cranked out over 500k, there aren’t many untouched and solid examples left. 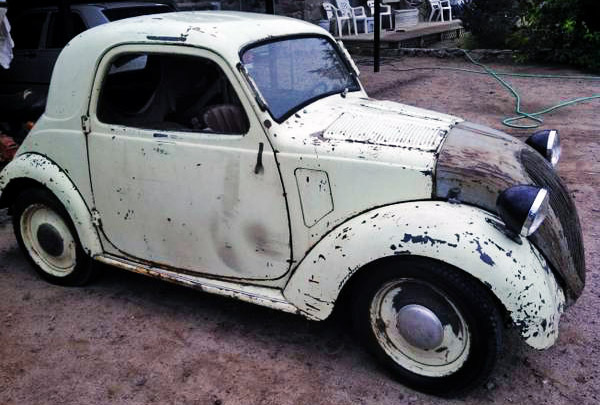 This 1947 Topolino is in need of a full restoration, but it’s unmolested and would make a great starting point. Have a look at it here on craigslist in Las Cruces, New Mexico. Special thanks to Andrew S for this tip! The quirky styling, low weight, and compact design made them a great, but unusual choice for drag racers. Some racers were intrepid enough to try using the original chassis, but most built a custom tube frame and roll cage to mount the body and drivetrain too. 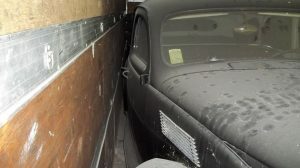 As complete cars became more difficult to find, fiberglass replica bodies became a lighter and more affordable option. There are still those out there who like to build dragsters, hot and rat rods out of original cars, but given how complete this one appears to be, I hope it is restored rather than modified. 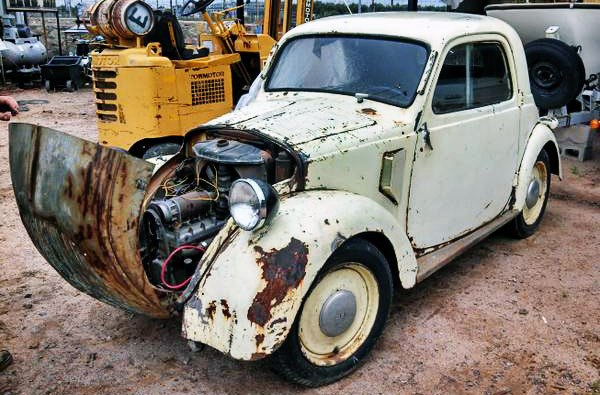 When the Topolino was introduced in 1937, it was the smallest car on the road. It’s 569 cc four cylinder motor was only good for 15 horses, but a car this small doesn’t really need much power to get around. Even at just 10 feet long, it’s amazing how many people could be shoved into one of these tiny cars. There are reports of some Italian families fitting as many as five people into their Topolino, which is not only amazing but terrifying. I actually remember seeing one of these as a child at the circus, of course it was painted in bright colors and was stuffed full of clowns. I was both amazed and terrified by the sheer number of clowns that could be stuffed into such a tiny car. What’s even more amazing is that seeing this car hasn’t triggered a flashback to any childhood clown nightmares! All joking aside, these were amazing little vehicles and it is easy to see why they were popular to so many groups and for so many purposes. I truly hope someone will restore this car and keep it on the road, even if they decide to stuff it full of clowns. This is one of the few cars I have seen that brings a smile to your face. It doesn’t matter your age or taste in cars, there is just something about these little machines that makes you smile! I’m not sure I would ever want to own one, but I’m definitely glad there are people out there willing to save and share them. I know seeing this one restored would bring a massive smile to my face! So does anyone remember seeing these at the local drag strip… or circus? Please, PLEASE don’t rat rod this little Topolino, which IIRC means ‘little mouse’ or something similar in the country of its birth. These were a landmark car in the late ’30s and especially early post-WW2 Italy, where they put whole families on the road when almost all other cars were out of financial reach. Every one of them deserves to be saved so people can see what ordinary families used for personal transportation back then. This one looks to be an easier job than a lot of BF cars. And even if it needs serious work on the underside, there isn’t that much of it to work on—just a little over 10 ft. So I’m guessing it could be an easy resto for a competent tin knocker. Are those raindrops I see on the headlight buckets? In sunny NM? I guess there’s an explanation for the bit of rust on this little mouse. Considering the prices that many micro-cars are fetching these days along with what an iconic and important car this model was it seems not out of the question to me that someone could potentially restore it enjoy it and eventually sell it for a profit. If he’s unwilling to put a price in the ad he must think it’s worth a fortune as-is. And remember, No Texts! A major reason why so many of these cars died is because the engine has an aluminium head which does get corroded and then becomes difficult to fix, and expensive. In India these were even assembled, so there were a lot around, but few run because of this issue. In Mumbai alone there were about 15 Topolinos lying around with engine issues. They were moved when real estate and parking became expensive. This car has been up for sale for quite some time now. Earlier in this year, he was asking around 9K for the mouse– in this condition, it’s just not worth it. Car is in Las Cruces, NM not Albuquerque. It’s a 500 series car with the 570cc engine. Worth about 1100-2000 in that condition but as it’s rarer than clothing on Kim I’d guess a lot more. Just talked to him: Way more! He’s asking $9500.00. Oof. That is a number 1 car value. Nutz. Thanks for catching that Waynard! I went ahead and corrected the location to Las Cruces. I must have seen Albuquerque at the top of the CL ad and then just typed it instinctively. Wow that’s quite the asking price. Did he at least give you some additional history or information about the car’s condition? He didn’t say much except to ask me if I knew anything about Topo’s (I do, a little). He was a little abrupt and sounded quite sure and maybe defensive, feeling, I think, that he’d priced it right and I was speechless when he told me the price. I thanked him and let it drop as getting into “price” conversations with an owner that prices their cars out of reach is futile, especially since I’m interested only peripherally. Don’t read too much into that though, it could be my mistaken perception. Given the rust on this car I doubt seriously it was originally shipped here to NM. 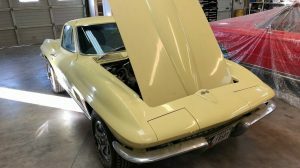 It’s a really nice find for this part of the country and very definitely collectible and restorable as I see it. Someone should try to work a deal. And now that I think about it, with a full restoration, even at triple that price at resale you’d be upside down or close to it. Dolphin: It really DOES rain here once in while, particularly this year. 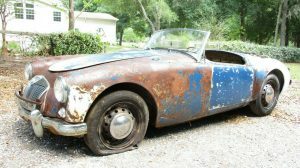 So what is a car like this really worth? Are they that hard to find? I like the car but not the price. $1100-2200 max. See my earlier comment. Book is actually slightly lower. Consider rarity though. If I were seriously interested I’d probably offer $2200-2500, considering cost of moving it, finding missing parts and so on. #1 value on these is only about $9000 -10,000. You’re pretty well upside down on this quickly. At least he has a title; that’s worth $400-500.